Pep Guardiola played an unusual system, but it didn’t help Bayern break down Manchester United. Guardiola fielded Toni Kroos in the pivot role, with Thomas Muller in midfield and Mario Mandzukic returning upfront. David Moyes brought Shinji Kagawa and Darren Fletcher into his midfield, and recalled Patrice Evra and Chris Smalling at the back. The pattern of the game wasn’t significantly different from the first leg, and the major talking point was Guardiola’s use of his two full-backs. It was surprising that Lahm was seemingly deployed as a right-back, considering Guardiola was without both Thiago Alcantara and Bastian Schweinsteiger from his midfield zone, and therefore Lahm was surely required in the holding role he’s occupied for most of this season. 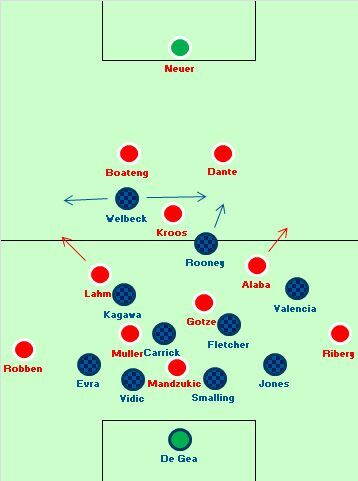 However, moving Lahm to right-back also made sense considering Manchester United’s approach in the first leg, where they left Bayern’s right-back Rafinha unattended, in order to pack the centre and use Danny Welbeck’s pace upfront. Moyes used a similar approach here, and therefore Guardiola seemingly wanted to use Lahm, one of his most dangerous players, in a position of freedom. Lahm, however, started the match in the centre of midfield, with no-one occupying the right-back slot – Jerome Boateng was shuttling out there when needed, but he was basically a right-sided centre-back. It seemed Guardiola wanted Lahm to cover both the right-back zone, and the centre of midfield. 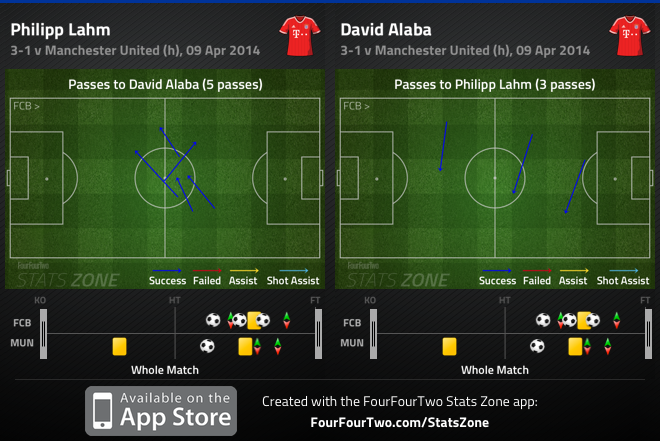 Furthermore, David Alaba was fielded in the same role from the other flank. They took up extremely narrow positions, often either side of Toni Kroos, before reluctantly shuttling back into the full-back zones when Manchester United counter-attacked. It was extremely difficult for Lahm and Alaba to recover their positions quickly, however, and therefore United were afforded promising situations on the break, through both Welbeck and Rooney. Welbeck again stayed high up the pitch towards the left, and there were a couple of nervous moments when Boateng was forced to sprint over to the touchline to make a crucial intervention, to prevent Welbeck getting in on goal. Boateng and Dante were forced to cover the width of the pitch by themselves, with little defensive support. The intention from Guardiola, clearly, was to pack the centre of the pitch to guarantee ball retention, and therefore allow the players high in the midfield triangle – Muller and Mario Gotze – to concentrate on providing a spark in the final third, something lacking in the first leg. The five attacking players all bunched around the Manchester United penalty area, and the away side never really relieved the pressure. The downside, however, was that it forced Arjen Robben and Franck Ribery to stay in extremely wide roles, providing the width for the entire team. This meant they were frequently unmarked and available for quick switches of play, but the lack of overlapping from full-back meant it was more difficult for them to cut inside and shoot, which remains a speciality of both. It also meant they couldn’t drift inside into pockets of space between the lines and combine directly, which was Bayern’s most promising approach in the first game. It’s worth considering, too, whether their duty to stay wide means they should have switched flanks. They were both being encouraged to go down the line, so wouldn’t they have been more dangerous on the side corresponding to their strongest foot? Ultimately, it’s difficult to see how the system helped Bayern here. It seemed to hamper the roles of the wingers, pushed Kroos into a position where he couldn’t provide incisive passes, and therefore resulted in slow build-up play. Possession dominance was the benefit, of course, but wouldn’t have that happened anyway? Guardiola may have been influenced in this respect by Marcelo Bielsa, his coaching inspiration. With Chile, Bielsa also used full-backs making very narrow ‘underlapping’ runs, inside wide players who stayed near the touchlines. However, Chile also played extremely direct football, and the full-backs were supposed to charge forward untracked, rather than simply add to the midfield numbers game. Another example is the role ex-Bayern left-back/central midfielder Ze Roberto played for Hamburg, combining the two roles. That report suggests he and Ribery caused more problems with their positioning. On this occasion, Bayern eventually produced what was considered, at that point, their best performance in the Bundesliga under Guardiola. So it’s clear the system has worked in the past, but this match wasn’t a great advert for the concept. It was particularly telling that Bayern’s best spell came at 1-1, after Guardiola replaced Gotze with Rafinha, who played at right-back, moved Lahm back into midfield, and shifted Muller forward. Bayern were now 4-2-3-1, similar to the way they played last season, and were terrifyingly direct and purposeful on the ball. The full-backs weren’t overlapping much more, but somehow Ribery and Robben seemed to find more space, and Muller was allowed into the box more permanently. Muller added the second with a classic poacher’s goal, Robben grabbed the crucial third after cutting inside, across the area, for maybe the first time in the game. Guardiola’s ability to think outside of the box, using players in unusual positions and playing formations from decades gone by- at both Barca and Bayern – has been incredibly interesting. He generally likes to risk conceding space at the back in order to provide attackers higher up the pitch, with his 3-3-4 at Barca particularly memorable in this respect, and he’s determined to have permanent width on both sides, yet cram as many players into the centre of midfield as possible, too. It’s arguable that Guardiola’s downfall at Barca – at least in a pure tactical sense – was his insistence on evolving the side a little too much, and at Bayern again there’s a danger he’ll experiment unnecessarily at the cost of raw quality. Bayern Munich are a significantly better side than Manchester United, but United took the lead twice in this tie, and were only beaten in the 166th minute of a 180-minute tie – once Bayern had returned to their default system. There’s clearly something to work with, in terms of full-backs providing an extra midfielder. It might be interesting to see them do it alternately, however, with the other playing a traditional full-back role and providing overlapping runs, a concept which was sorely missing throughout this game. Seems like Pep went with oldschool 2-3-5. Football Hipster. Guardiola did something sort of similar with Lahm against Arsenal – once Lahm had moved into the middle, he still kept breaking right, and overlapping Robben and Rafinha there. he combined being a holding midfielder when Arsenal had possession with being a right-winger when Bayern did! inverting, the inverted pyramid… ..and false full backs. great analysis as usual. Do you think Pep did this just to try it out against weaker opposition and also possibly hiding his full game plan against future opponents? There’s a reason the W-W went out of style 50 years ago, it’s just too easy to clog the middle of the pitch. United weren’t able to be drug out of position. It just seems too easy. 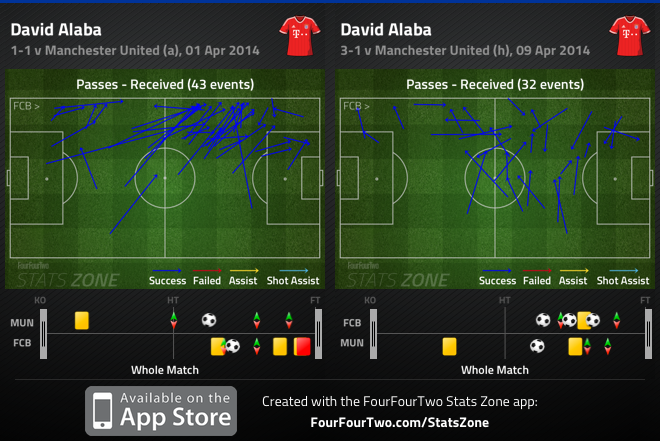 The question is, if united hadn’t scored would he have brought on Rafina? I think going into this leg not needing to score allowed him to play around a little bit with the knowledge that if they needed it he could make one tactical switch and united wouldn’t be able to keep up. I’m glad there is a manager at least willing to try a different formation from a 4231 or a 433. It’s good for the game! My impression was that it was Guardiola’s design to spread Ribery and Robben out as much as possible and let them go 1v1 at United’s fullbacks. Packing the center of midfield would prevent Valencia and Kagawa from double-teaming R&R. Even without an overlapping run, I’d put my money on those two to get plenty of joy running at Phil Jones and a half-fit Patrice Evra. Jones had a blinder and nullified 1/2 of the plan. Valencia and Kagawa were also able to help a lot defensively because the midfield was so crowded that Carrick and Fletcher could handle it alone. Gotze couldn’t find the ball in the first half b/c Lahm and Alaba were taking up his space. I agree that Guardiola was probably too clever here. But I see the logic. If I’m Pep, I like my odds when R&R can get isolated with United’s fullbacks and have a running start from the touchline. The center of the park just got a little too crowded, which allowed Valencia and Kagawa to help defend Bayern’s wingers. And Jones stood on his head. I think Jones looks a really promising player. I judge by the highlights, I admit – but, heavens, watching a whole ManU game at the moment is no occupation for any non-sadist. At first it was very funny, I admit, but then it became just too leaden, dull and predictable. I suppose it might be droll to attend a match and watch Fellaini’s every move though. Germany and Bayern do not have Spain or Barcelona’s quality. If they insist on playing this way they will lose games they should win. Even the Spanish get themselves into trouble when they over exert their philosophy. The German national team is playing the same way. They tried to dominate Italy in the centre of midfield and it could be seen that Italy looked the more comfortable. Even Barca have gone overboard, continually insisting on playing Iniesta as a wide forward, when you play that narrow it always favours teams that play a solid defensive shape. The Italians in particular love it. As well as Atleti who can then just press for dear life in midfield. What did Simeone say “We gave them the wide areas”. Barca and Bayern are the best teams in the world but they keep mucking around too much with their tactics. Guardiola cost Barca the Spanish title in 2011-12 because of his experimentation and I still believe to this day that the best Barca side was the 2008-09 version that could dominate position but still be absolutely ruthless on the counter from high or deep. Bayern will better hope they don’t get Atleti because my money will be on the Spaniards. ZM’s analysis on Bayern’s winning campaign last year is particularly pertinent. As a Juve fan, if Bayern want to play this way against us then I would be more than happy. I generally agree with your observations. Pep sometimes being too clever and ended up playing against himself (or his tactics). I like some of his experimentations and it is good for the game’s progress but he often get carried away with it. His obsession on mindless possession is really hard to agree with. What he has done is turning Bayern into a slower and less direct team thus much easier to read and defend against. He got away with Barca because of Messi and his pace. Secondly some of Bayern players have aged and not as good as last season – Ribery and Robben for example are not the same players there were. Same goes with Mandukic though Lahm is playing better than ever. For Bayern this season is different because no team will play an attacking game against them except perhaps Barca. I doubt Ancelotti will either. All will sit back and hit Bayern on counter. This is different from last season when Bayern did not face the same problem. Bayern faced the same problem last season and noone played attacking football against them. Even Barcelona didnt play attacking football against them, because Barca dont play attacking football at all. Bayern played this central full backs in the league quite often this season. Guardiola wants the centre to be protected, especially against counter attacks. Alaba playes in defensive central midfield in the Austrian national team and Lahm played there too this season. Both players know what to do and Bayern played this tactics as well this season. So, this is not an unusual formation for Bayern. The good thing about Guardiola is that he has more than one tactics in his pocket. He adjusts tactics during a game nearly every game. Sometimes due to adjustment to the opponent, sometimes because they scroed or conceded a goal. Maybe Bayern looks like they lack ideas or the right tactics, but there are not many teams that adjusts as often and easy as Bayern. In my eyes as Man Utd Fan, Moyes did good to hold Bayern. When you have opponent with a great dribbles like Robben & Ribery who able to cut inside and win 1 on 1 situation, formation with 2 defending SD and 2 solid DCM is good option. however, we hope in the other 4 attacking player to make a counter attack. When we have a lead and they responds quickly, i already see that the game start to become more direct. Then Bayern 2nd goal occurs. Moyes need to do something, because he need to make a goal to qualify. too bad he took wrong decision. Bring in Hernandez is a good option, but take out Fletcher is wrong. Fletcher and Carrick has been a vital holding midfielder. break this meaning we only have Carrick as our defend midfielder. Thats why Robben can make the 3rd goal and cut off our chance. If only Hernandez was subtitute Valencia, we should do okay. As a united fan, I do feel pity for how we get equalized. We should have do better, but same for Bayern. There is nothing new here and something he has done all year. Pep fundaments is around 4 1 4 1 in defence and 3 4 3 diamond or magic rectangle in offense. I ve been wondering why you never write about the actually formation bayern and barca play in offense. In Bayern he plays more universal and has the template of 3 1 3 3 diamond of Bielsa. But more universal. He wants to wide men. Mostly either winger or full back. The other takes part of the 3 behind striker. one of the central midfield goes in the central attacking slot. Since he now use two at the back. He has one more midfielder that either stays behind in 2 2 5 1 formation or in a nr 10 slot in a 2 3 4 1 formation. The only difference from Barcas last seasons is that he is playing one less defender and less fixed positions in offence. In Barca. Dani foward and abidal back 3 1 3 3. Against villarreal Tiago was acutally playing right back in defence, but in the three in offense. The difference is that is now universal. But he plays with the same Idea. Players in all 5 channels inn attack and the rest in the attack. With the magic rectangle, bus, xav, ini, messi eto, hen, they where more counter threatening but with the diamond its even easier to keep possession, but less threatning for penetration. the 4 2 4 you wrote about is the same magic rectangle as wenger and pellegrini now use and that wenger used in invincibles. one wide and high attacker, one 10 coming in and one 10 in the middle behind a striker. If you look at barca shape they play, the magic rectangle. xavi, busi. Iniesta (And either fab or messi takes the 10 role, the other center forward). Neymer high wide striker. For me this is what would be intersting to se you write about, but now I wonder if you havent got it. Guardiola belives in positinial play and these positions are very clear to see. It just now is more universal. About Peps system, it takes the opposition lower than a stand 3 1 3 3. I know the spare man and thats why he do it, but on the other side, if he had kept one of his full backs back, like Abidal, I think they would have more room to play and better cover for counter attack which are theirs weakness in defence.